This is probably blindingly obvious to some people, but not to me. It was only when I was in a cafe paying £3 for an iced coffee that I realised I could’ve made it at home in my Nutribullet for pennies. I tend to think of it as strictly for fruit and veg smoothies, but it’s a lot more versatile than that. If you follow me on Instagram you’ll see some of the swamp-coloured concoctions I’ve whizzed up since getting a Nutribullet last Christmas. Trust me, they taste better than they look. Most of the time, anyway. As recipes go, making iced coffee in a Nutribullet is laughably simple. Just chuck in a few ice cubes and top with cold coffee. Add milk if you’re being fancy and want an iced latte. Then whizz it up and you’re done. If you’ve got half a pot of left over cold coffee then this is a great way to use it up. 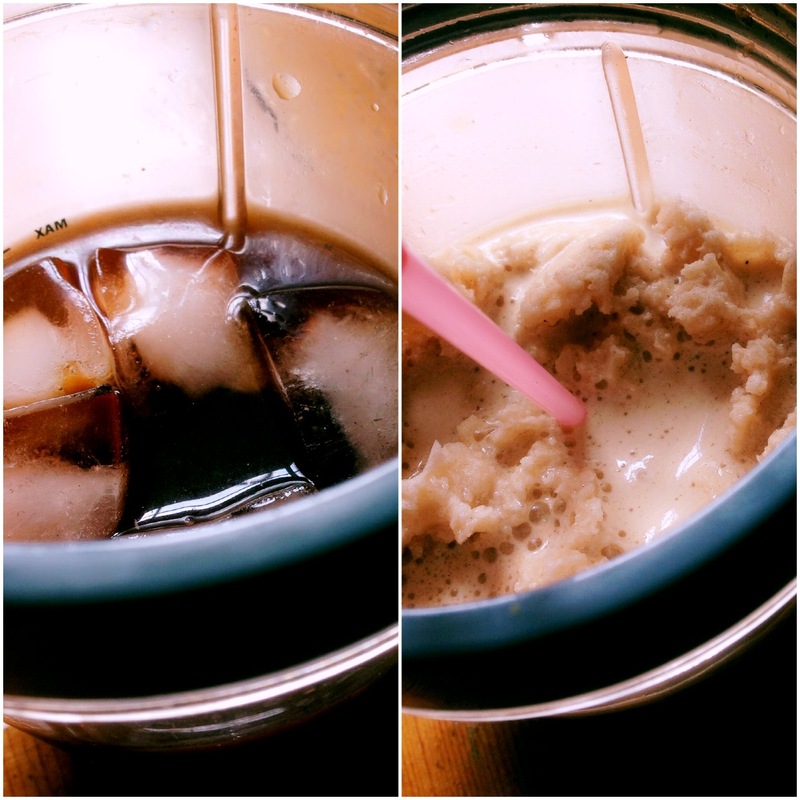 It won’t taste as sweet as most cafe-made iced coffees. Next to a Frappucino, the home-made version is positively bitter. This is purely down to the lack of sugar, so add a flavoured syrup if you want to. If you haven’t got any syrup but you still want a sweeter taste, dissolve sugar in hot water before chucking it into the mix. Larger ice cubes make a slushy-type texture, as seen in the picture on the top right. Smaller ice cubes tend to disappear into the blend, giving a smoother and thinner texture. You could also try this in a food processor if it has a strong enough motor to handle ice cubes. However, this would be a faff and probably produce more washing up than a sane person can handle on a hot day. The down side to home-made iced coffees is that you still have to make it yourself, plus wash up afterwards. And there are no interesting people to stare out the window at. So I don’t think any cafes are going to go out of business if we go down the DIY route. Have you made anything interesting in your Nutribullet* lately? *insert smoothie maker of choice. I hear good things about the Nutri Ninja, though alas it is no use in martial arts or espionage, despite the name.